2017 seems to be the year in which the world has caught up with the gardeners and realised that gardening is good for our mental as well as physical wellbeing. Or possibly it is just that the mainstream media has finally picked up the message. 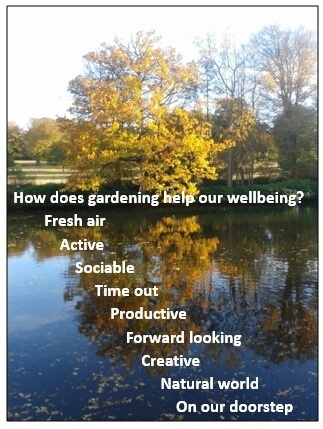 The formal term for using gardening activities to support or enhance wellbeing is Social and Therapeutic Horticulture and here I am looking at what this is and who it can help. I came to this subject from the gardening side: I was already advising, teaching and talking to homeowners and gardening clubs and so often I heard comments like “at the end of a stressful week I go out into the garden/allotment to recover”. These remarks are not meant as a medical diagnosis or a flippant remark but they are a genuine expression of the restorative power of time outside, physical activity and focusing on something positive and forward looking. If it works for people who have already discovered the joys of gardening, why not for the uninitiated and especially for people for whom anxiety and depression are ever present? And it turns out that there is substantial evidence to prove that it does. Coventry University, that together with the charity Thrive provides education and qualifications in Social and Therapeutic Horticulture (STH), defines it as “The purposeful use of horticultural activities to promote health and well-being and facilitate social inclusion”. STH falls under the wider umbrella of ‘Green Care’ therapies, along with activities such as environmental conservation, animal assisted therapy, green exercise and farming projects. The whole sector has been the subject of much research and reports, including several commissioned by the UK Government and conducted by universities with leading mental health charities. The overall conclusion is that ‘green care’ offers significant benefits to mental health. These include a direct reduction in depression, anxiety, and stress symptoms, along with increased self-esteem and confidence, social contact and inclusion and a sense of belonging and personal achievement. These latter benefits are recognised as key in improving and maintaining good mental health. The other main observation from research projects is that green care therapies are very flexible in how they are used depending on the needs of the individual and gardening, being familiar and accessible to a huge proportion of the population certainly fulfils this. As I see it there are three ways to use gardening for green therapy and the difference is simply where they fall on the continuum from gardening to therapy as the primary objective. At one end are the people I met first, enjoying gardening like many hobbies as a simple de-stress mechanism in their daily lives. Next comes the use of gardening as a conscious measure to maintain or improve mental health for people with mild and managed mental health conditions or at risk through isolation. This is where my experience lies, working with varied groups such as a housing association and local mental health and brain injury centres and involves a mix of gardening discussion, learning and practical activities tailored to the participants. And thirdly there are structured, long term projects where people with more serious mental health support needs join with qualified STH professionals mainly for practical gardening. And here the activities are chosen primarily to provide therapy according to the needs of the individual. The most encouraging thing is that Social and Therapeutic Horticulture projects are increasingly being recognised as an effective therapy by mental health support providers (and funders!) so I am hopeful that gardening can soon help the wellbeing of many more people.